It�s hard to believe, but if one of Dustin Pedroia or Kevin Youkilis walks away with the American League MVP award this afternoon, it will be the first for Boston since Mo Vaughn eked out Cleveland�s Albert Belle in 1995. A young Manny Ramirez, Belle�s teammate, finished 12th that season, three spots behind John Valentin, and one ahead of Tim Wakefield. Cleveland closer Jose Mesa finished fourth that year. Fourth. 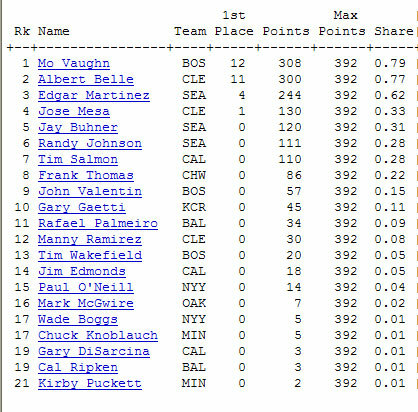 That could be significant as we look to this year�s award, particularly if Youkilis and Pedroia split the votes. If that happens, it�s then going to be a toss-up between Twins first baseman Justin Morneau and Angels closer Francisco Rodriguez. Could a guy that finished third in this year�s Cy Young voting actually be named MVP? It's possible, though it has yet to happen. Still, let�s go back to �95, when Randy Johnson won the AL Cy Young Award ahead of Mesa with 26 first-place votes to his teammate's two. Yet, the Big Unit finished two spots behind Mesa in the MVP voting with 19 fewer points. Oh, those wacky baseball writers. So, yeah, K-Rod�s name is in play, which would make him the lamest MVP recipient since, what? Willie Hernandez?